Between regular life and my super exciting NaNoWriMo experiment, my schedule has been a bit busy of late. (Hence the relative quiet here.) So I thought I’d start your week off right, with some free fiction. 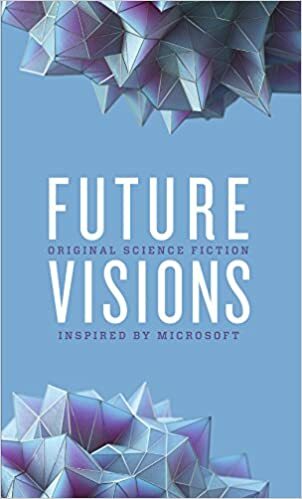 Today’s selection is a new collection of shorts produced by none other than Microsoft, which is venturing into the fiction futurism business. What’s it all about? How will the technologies the company is exploring affect our world? They’ve brought together a pretty great group of authors and artists to speculate on that very topic. Contributors include Elizabeth Bear, Greg Bear, David Brin, Nancy Kress, Ann Leckie, Jack McDevitt, Seanan McGuire, Robert J. Sawyer, Blue Delliquanti and Michele Rosenthal, and Joey Camacho. This link takes you to a Microsoft news page with jumps to Amazon and other download sites where you can get the e-book file for free free free. Granted, I’d rather not be rendered obsolete just yet but it’s good to be prepared, right? If you’re looking for more Stross to sample, a free ebook of Stross’s collaboration 2012 with Cory Doctorow The Rapture of the Nerds is also available. Thank you, Creative Commons! I am happy to announce that I will have a story coming out in the Summer quarterly of Mad Scientist Journal. “Just Like [Illegible] Used to Make” originally appeared in Perihelion Science Fiction, and I’m quite pleased that this story has found another venue. A new anthology is out for free from Tor.com, and it includes twenty-six of their favorite short stories, novelettes, and novellas from 2014. Tor.com does publish its fiction online, of course, but if you prefer a transportable and handy-to-read format for Kindle, Nook or similar device, you can download the full anthology now for the low, low price of nothing, nada, zip, rien, tipota.